Atlanta has a lot of great suburbs, but if your goal is to live in the best of them, then Decatur is where you will want to set down roots. Decatur is the county seat of DeKalb County, and it’s located just five miles northeast of downtown Atlanta. The city is well-known for its excellent public schools, colleges and universities, and safe streets, which is why it is such a popular place to raise a family. But, as popular as Decatur is with growing families, it is equally alluring to Millennials and retirees. In the city of Decatur, homeowners outnumber renters, 67 percent to 23 percnet. The median home value is $418,700, compared to $184,700 nationally. However, the median rent in Decatur is just $866, which is lower than the national average of $949. The most popular home style here is the bungalow. Decatur has low crime, excellent public services, and everything one needs to feel right at home. It’s the perfect place for families, young professionals, and seniors alike, so no matter where you are in your life, you’ll find living in Decatur exciting and rewarding. With so much going for it, why choose anywhere else? Decatur has easy access to three MARTA stations: the Decatur Station, the Avondale Station, and the East Lake Station, so getting around by public transportation is easy and convenient. But the fact that the city has three major expressways running through it (U.S. Route 78, U.S. Route 278, and State Route 155), results in most residents commuting by car. Decatur doesn’t offer much in terms of walkability, but the Stone Mountain Trail includes 15 miles of hiking and walking trails, including the one-mile trail to the top of the mountain, so walkers, hikers, and bicyclers will have plenty to keep them occupied. Decatur has a diverse population that spreads across many ethnicities and ages. 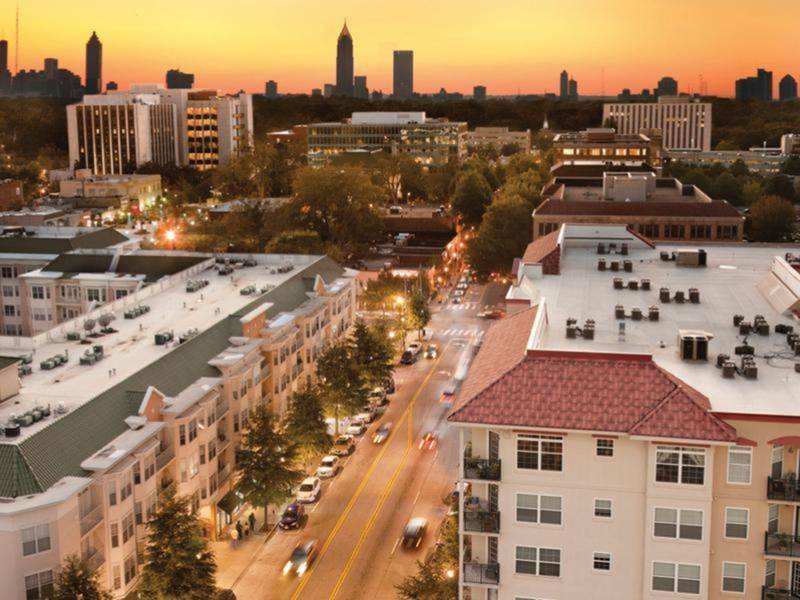 Females outnumber males here by a whopping 16 percent, and with 34 percent of adults having earned their bachelor’s degrees and 37 percent their masters or higher, Decatur is one of the best-educated cities in the Atlanta area. Decatur is also very popular among young families as children under ten years old make up the largest portion of the population at 20 percent. They’re followed by adults aged 35-to-44 years (17 percent). Meanwhile, seniors 65 and older account for 12 percent of Decatur’s population. Decatur is an affluent community with a median household income of $92,263, compared with the national average of $55,322. The median individual income in Decatur is $51,292, compared to the national average $27,419, although 41 percent of the adult workforce in the city earn at least $65K individually. Unemployment is Decatur is 3.4 percent, which is just short of the national average (3.8 percent). Atlanta is home to one of the hottest culinary scenes in the country, and Decatur has a lot to do with that distinction. The city is home to a variety of excellent eateries that cover all budgets and types of cuisine. For the best fine dining in Decatur, you can place your trust in the American/seafood restaurant the Kimball House, or the upscale setting and thick juicy steaks at Parker’s on Ponce. At Babette’s Café, you’ll have your pick of French, Spanish, or Italian dishes, and the cozy atmosphere at Sotto Sotto complements the fine European cuisine nicely. If you’re low on money but still craving something delicious, you don’t need to worry because Decatur has plenty of cheap eats for you to consider. Victory Sandwich Bar is a popular sandwich shop, while Taqueria Del Sol will fill you up with Mexican food for less than you might imagine. You can also choose from affordable Greek options at Mediterranean Grill, Asian barbeque at K BBQ Taco, authentic Indian food at Zyka Indian Restaurant, or pizza from Fellini’s Pizza. You’ll also find Decatur to be plentiful in nightlife options. Eddie’s Attic is one of the most popular places for live music and drinks, while The SOS Tiki Bar gives you a taste of the Caribbean. Brick Store Pub is your reliable traditional American pub and at Thinking Man Tavern, you’ll find the ambiance comfortable, as if you’ve been there a hundred times before. Decatur enjoys a rich culture and vibrant arts scene. Throughout the city, there’s incredible works of public art on display, like those at the Decatur Artway, the Living Wall series, and colorful murals everywhere. The city also hosts the annual Decatur Arts Festival, as well as several Art Walk events throughout the year. The historic Decatur Cemetery makes for a wonderful place for an introspective walk, and all over the city you’ll find buildings and structures listed on the National Register of Historic Places, like High House, Historic Oakhurst, The Pythagoras Masonic Lodge and others. Decatur is very pet-friendly with three dog parks for those who have four-footed friends, including Adair Dog Park, Glenlake Dog Park, and Oakhurst Dog Park, as well as another eight sprawling parks and eight public gardens for outdoor recreation for the family. In addition to the Arts Festival, Decatur also hosts the AJC Decatur Book Festival, Bonfire on the Square, Santa on the Square, a July 4th Celebration, and many other community events and festivals. Seniors enjoy living in Decatur because there’s always an activity for them to take part in, especially at the several Active Senior Centers in the area. Throughout the year, seniors can sign up for dance classes, Tai Chi, Yoga, Bridge clubs, aerobics, body conditioning and more. Decatur also has an Office of Aging, ICARE, a volunteer-driven agency that provides free transportation to seniors throughout the Decatur area, and many different places of worship. The DeKalb County library system is especially committed to seniors, and the region is home to more than five Alzheimer’s Association support groups. For medical needs, seniors have access to Emory Healthcare, Emory Decatur Hospital and DeKalb Medical services. Sign up for FREE, up-to-date home trends information below! Sign up below for FREE Atlanta home trends updates!